Smit Salvage has been ready to remove the fuel from the sunken Costa Concordia for two weeks, since January 28 (2012), but sea conditions have prevented the pumping phase of the operation from beginning. This video, shot late yesterday, very graphically shows the sea conditions at the wreckage and makes the delay very understandable. New data released yesterday says that the ship has moved two feet since the January 13 accident. In the video, it's also easy to see why conditions inside the ship have deteriorated with so many access points now open (including the retractable dome over the swimming pool now disengaged) allowing so much water to move through the ship. 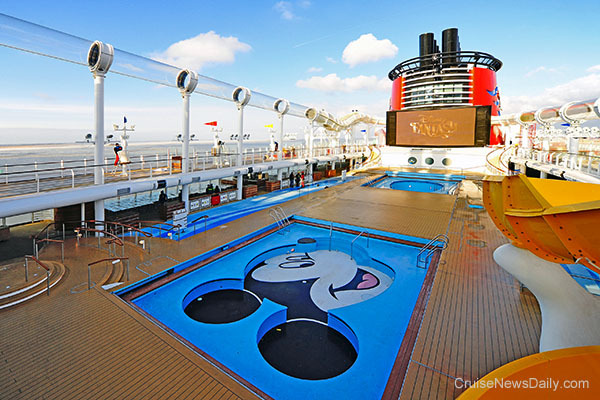 Meyer Werft delivered Disney Fantasy to Disney Cruise Line today in Bremerhaven. The ship will spend another week in Bremerhaven being crewed and provisioned. Departure for the US is planned for February 16, with arrival in its home port of Port Canaveral on March 6. 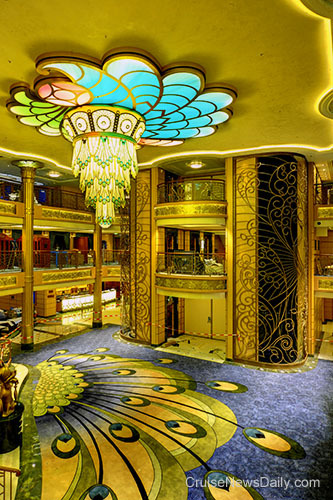 Disney Fantasy's maiden voyage is scheduled for March 31, 2012. 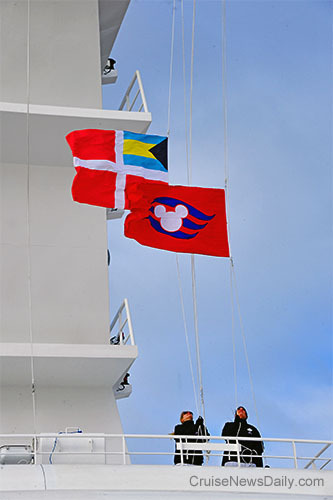 The flag changing that took place aboard Disney Fantasy this morning as soon as the documents were signed and the ship officially changed hands with Disney assuming ownership from Meyer Werft. 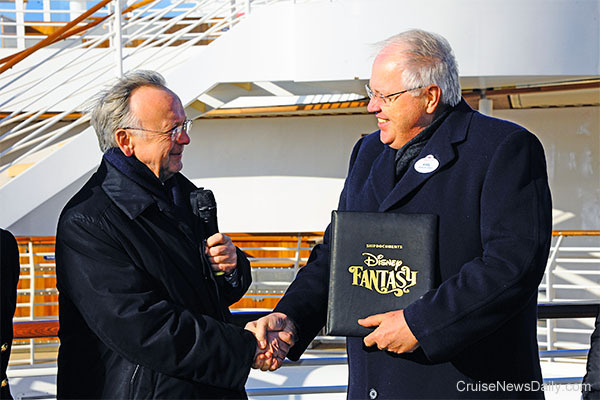 The documents officially transferring ownership were signed by Bernard Meyer, managing partner of Meyer Werft (left) and Karl Holz, president of Disney Cruise Line. Princess Cruises said today that the increased incidence of gastrointestinal illness that appeared on last week's Crown Princess sailing has reappeared on the current sailing, even though the ship delayed its sailing Saturday while there was a comprehensive disinfection of all cabins and public areas, which was overseen by the CDC. In light of that, after consultation with the CDC, Princess has decided to end the cruise two days early, on Thursday, so that the ship can undergo a two-day extensive sanitization. Crown Princess is now returning to Ft. Lauderdale where passengers will disembark on February 9. 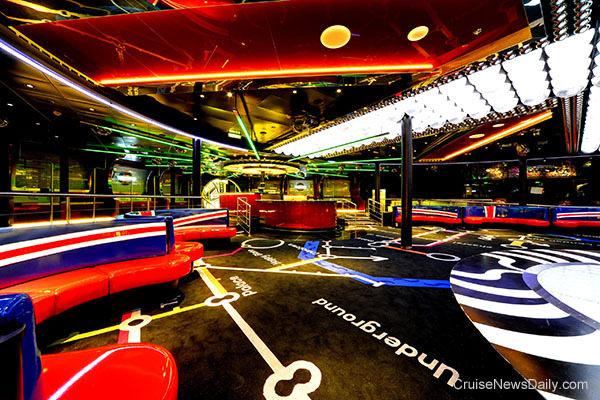 The cruise had been scheduled to end on February 11. 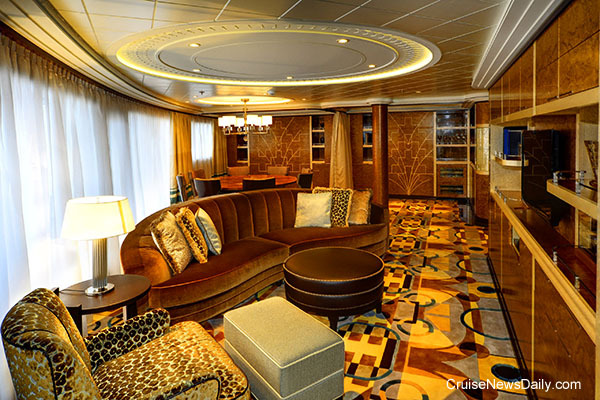 Passengers will receive a refund of their cruise fare, along with a 25% future cruise credit. Princess will also cover the cost of any change fees passengers incurred with their connecting air flights. After the two-day sanitization, the February 11 sailing is expected to depart as scheduled. Over the weekend, there have been dozens of articles running in newspapers across the country (and internationally), and even network, cable, and local TV coverage about two Princess cruise ships that have had outbreaks of Norovirus last week and were returning to port over the weekend. Princess did some additional disinfection when the ships turned around this weekend in Ft. Lauderdale, and that got coverage too. At the same time today marks the reopening of St. Ignatius Prep School in San Francisco. It’s been closed since last Wednesday when 355 students and faculty reported having Norovirus. Still, it seems to have received only limited local coverage. Here’s how the numbers stacked up: On Ruby Princess, 92 passengers out of 3,133 contracted the disease, as well as 13 crew members out of 1,186. On Crown Princess, 394 of 3,103 passengers and 30 of 1,168 crew on Crown Princess were affected. It also has to be remembered, that these are total numbers for the entire 7-day cruises. The time that anyone is experiencing symptoms is normally a two- or three-day period. Princess didn’t have day-by-day statistics available, but over the course of the cruise, only a fraction of those total numbers would have been experiencing symptoms on any given day. Of course that makes the numbers look much less dramatic. St. Ignatius’ percentages are quite a bit higher. According to local news reports, when the school was closed on Wednesday, they had 325 students of 1,444 reported ill, and 30 faculty members of 103 calling in ill. It appears that all 355 were experiencing symptoms on Wednesday. Over the weekend, Princess had a professional service come aboard their ships to assist the crew with disinfecting the ships with disinfectants developed especially for Norovirus. The school had custodians come in and disinfect areas with bleach. According to the CDC, Norovirus is the second only to the common cold in worldwide illnesses. For some reason every time it occurs on a cruise ship, it makes national headlines with commentators blaming the cruise lines for not keeping their customers safe and healthy. Yet, when a much larger outbreak occurs on land, it barely gets any local coverage, and it gets shrugged off by the media as “stomach flu.” Go figure.